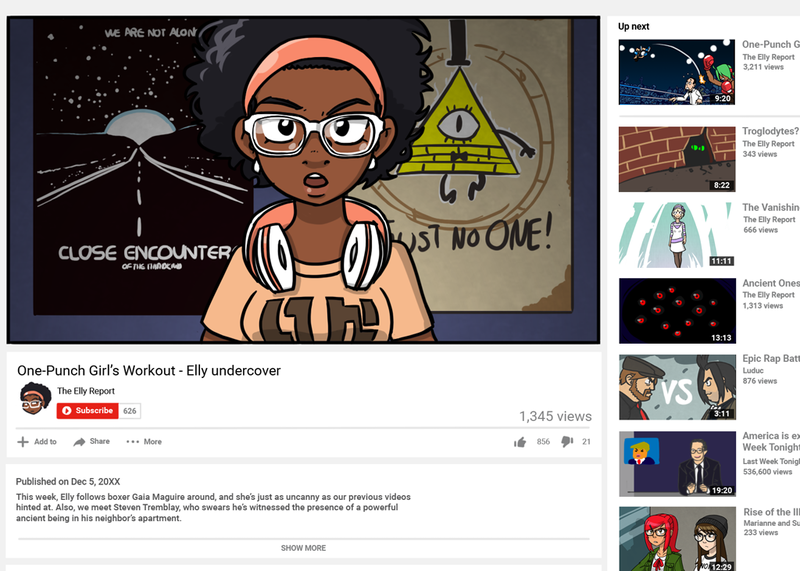 And now, you know what Eleonore was up to, reporting on mysterious occurrences in her city weekly, on her Youtube channel. Indirectly, she’s responsible for most of the Frivolesque girls getting together in the first place. Too bad her videos also get noticed by ominous individuals. The truth is out there, so very way out there, it is staggering just how way out there the truth really is. You have to search far and wide for it. Tablet with a broken heart sticker? This really can’t be good. Btw, there’s an “c” missing in “subscribe”. That definitely can’t be good. And thanks! I fixed it! She filmed Laurence! Now we have a documentary proof she exists for real! Take that, unbelievers! Dez, would you recommend Gravity Falls? I kinda doubt if it’s my type, though I liked Steven Universe and Adventure Time. Also, high-resolution version of the first frame would be nice. And… Gravity Falls? I’m no expert on the subject, I only watched a few episodes, but I liked what I saw. I already got it done! It’s been incredibly fun for some reason. I do love those little details and art you can spend time exploring for hints and jokes and easter eggs. I left some lines intentionally untranslated (posters on the wall, since they are the same in EN and FR versions, Ludus and Last Week Tonight, because those are real Youtube channels). I wonder if she’ll ever do a video on Nole the grandaughter of Santa and her annual yuletide adventures with Chloe? I mean technically that all might be a dream but Laurence isn’t exactly 100% confirmed as existing and she gets a video so I think it can happen. Actually I think her name’s spelled Noelle. My bad. Nice a big bad. And Bill.